OSWEGO, NY â€“ Even though it snowed in April, the first time since Feb. 28, last month goes into the record books as the second warmest April on record. The warmest April is 52.0 degrees in 1878.
â€œThe average temperature last month was 51.7 degrees. Thatâ€™s 7 degrees above average â€“ and the second warmest on record since 1844,â€ according to Bill Gregway, local observer for the National Weather Service. 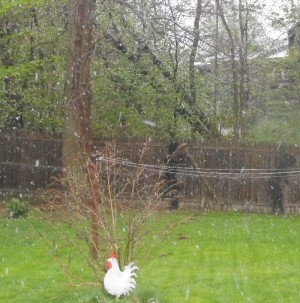 The wet snow flurries April 27 amounted to just a trace, and did nothing to lower the month's record-setting warmth. â€œThe average temperature last month was 51.7 degrees. Thatâ€™s 7 degrees above average â€“ and the warmest on record since 1844,â€ according to Bill Gregway, local observer for the National Weather Service. The highest temperature last month was 84 degrees on the 3rd and the lowest was 33 degrees on the 23rd. There were 3 times in April the temperature was in the 80s, and all three of them (80 on the 2nd, 84 on the 3rd and 81 on the 8th) were all records, Gregway added. â€œWe had 2 days in the 70s and all the rest were lumped into the 50s,â€ he added. They say the first few days of April predict how the summer will turn out. Total precipitation last month was 1.33 inches. That is 1.99 inches below average. Since the first of the year, the precipitation stands at 10.33 inches, which is 2.97 inches below average. The most rainfall in a 24-hour period was 0.57-inch on the 7th. There were no thunderstorms, which is 1 below normal. And, there were 2 foggy days, which is 1 above normal. That left April 4.3 inches below average for snowfall. For the winter the snowfall (117.0 inches) is 33.8 inches below average. There were 10 days with measurable precipitation, with 6 in a row. One day had just a trace. And, there were 19 days of no precipitation, with 8 in a row. The highest barometric pressure was 30.61 on the 14th and the lowest was 29.31 on the 26th. The greatest wind speeds were greater than 30 mph out of the west on the 8th and 28th. â€œActually, we had 5 different days, all right around the end of the month, with winds at 25 mph or greater,â€ Gregway noted. April 2009 (46.4 degrees) was 1.7 degrees above average. The warmest and lowest temperatures last April were 87 degrees and 26 degrees, respectively. Precipitation was 0.09-inch above average in April 2009. There was 1 occasion of ice pellets and 1 of snow pellets, Gregway added. After last month, the second warmest April on record is not that long ago â€“ 50.9 degrees in 2008. In third place is 1921 with 50.2 degrees. The coldest April is 1926 with 30.1 degrees. The highest temperature in April (90 degrees) came in 1990 and the coldest (11 degrees) came in 1923. The wettest April is 1859 with 7.03 inches and the driest is 0.61-inch in 1915. Holding the honor for snowiest April is (7.9 inches) 1983. Going back to 1900, there have been 6 times when April didnâ€™t get any snow.